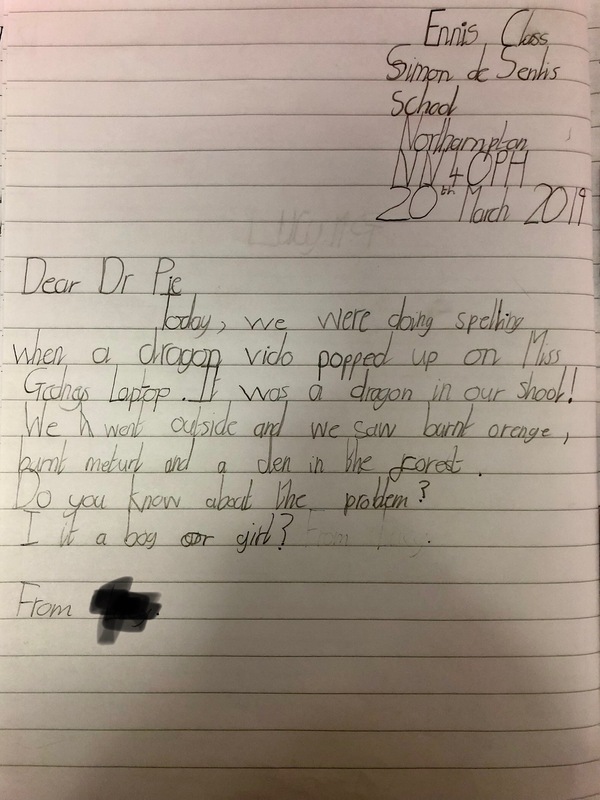 A dragon in the playground?! This morning, after spelling a video suddenly popped up on the screen! It said Breaking News! followed by a video of a dragon in the playground, just outside Year 3! Have a look at the video here. It was all very exciting so we had to go outside and investigate. 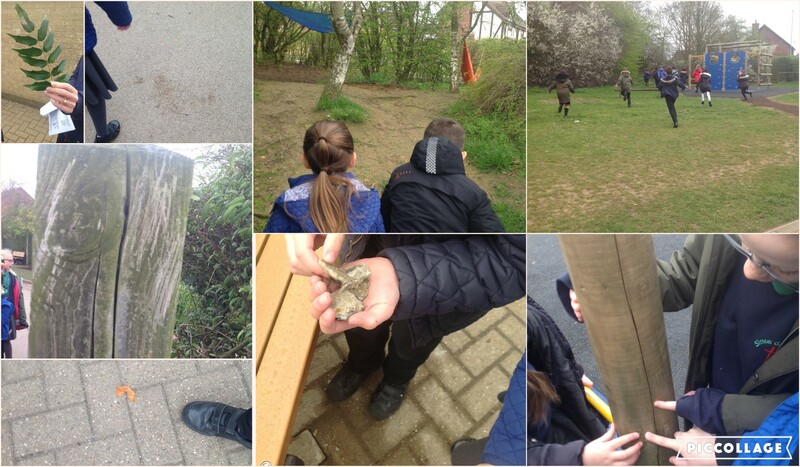 We found so many things that we thought were linked to the dragon, a den in the forest, burnt orange skins, scratch marks on the fence and giant muddy patches on the field. We couldn’t stop finding evidence! When we got back inside, we wrote down all of our evidence in our Magpie books. 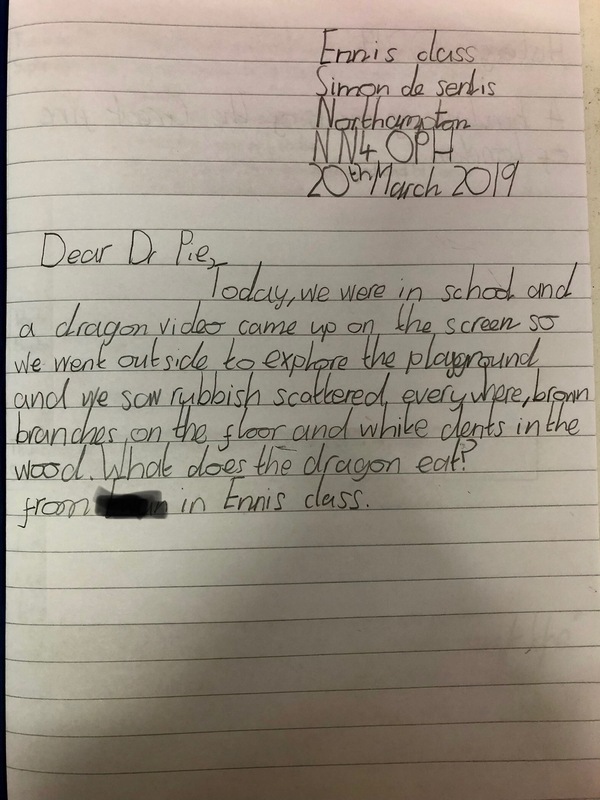 Hopefully this will help us later in our writing, when we write a report all about this dragon. 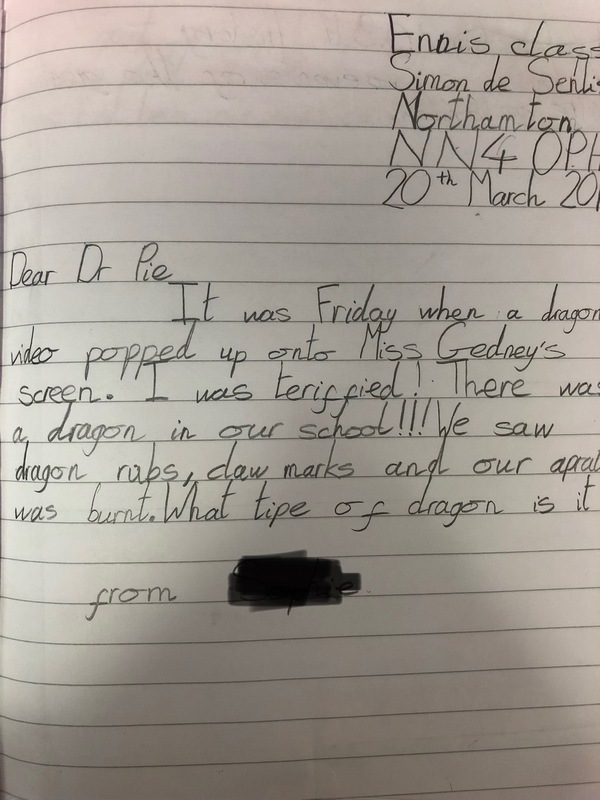 Luckily, Miss Gedney and Miss McGarrity had been sent a special book called ‘Dragonology’ and it told us lots of important information about dragons. It didn’t tell us any information about the type of dragon that was in our school though. Inside the book, there was a letter from a dragonologist (someone who specialises in dragons!) 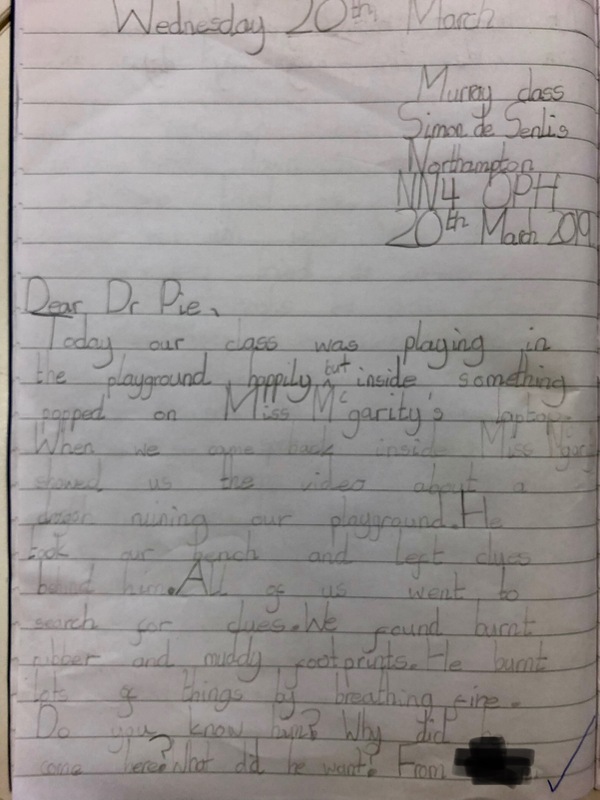 so we wrote a letter to Dr Pie Corbett, a local drgaonologist, for some answers. We had some great questions about the dragon, such as, where did it come from? What type of dragon is it? Why does it breathe fire? 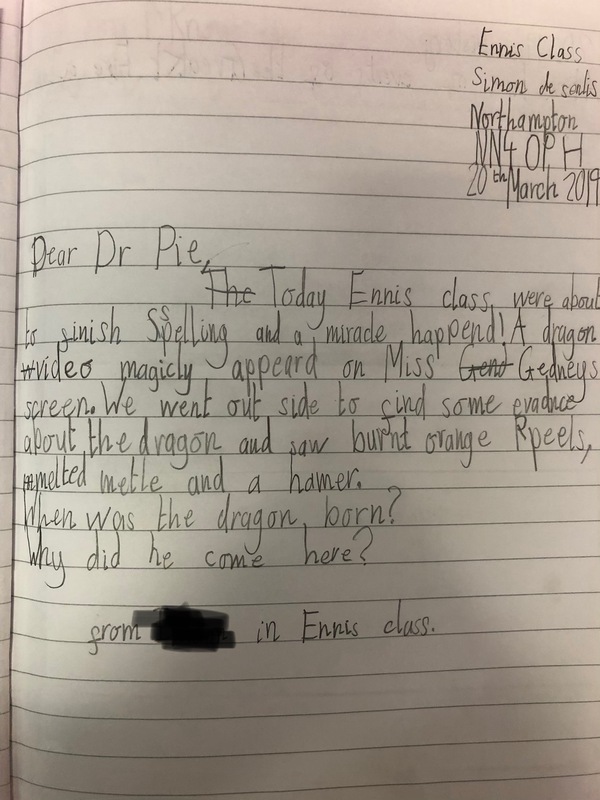 Hopefully, Dr Pie gets back to us with some answers about our new dragon friend and we can begin to learn and write a report about it, so stay tuned for more updates! ← Dramatic Derngate Dancers Wow the Audience!